Over 50 years ago, in a 1963 Chicago protest against school segregation, one of today’s Democratic candidates for president was chained to a black woman and then arrested for resisting arrest. Now that moment appears in an unofficial campaign poster emphasizing the candidate’s commitment to civil rights. That protestor for black rights in 1963 was not Chicago native Hillary Clinton, then a politically active Republican supporting Barry Goldwater for President, even though he opposed the Civil Rights Act. Now Clinton is politically strongest in the same southern states Goldwater won in 1964 – ponder that irony. Probably my great privilege as a young woman was going to hear Dr. Martin Luther King speak…. I sat on the edge of my seat as this preacher challenged us to participate in the cause of justice, not to slumber while the world changed around us. And that made such an impression on me. But it did not make such an impression that she couldn’t support Goldwater (to be fair, he helped integrate the Arizona Air National Guard). And it didn’t make such an impression on her that she actually participated in the Civil Rights Movement (making Clinton-supporter Rep. John Lewis’s denigration of Sanders’s civil rights record look like a pretty hypocritical cheap shot, but that’s what happens when the establishment circles the wagons). It’s not that Hillary Clinton is terrible on civil rights, she usually manages to end up on the side of the angels, more or less, but she has never shown the willingness or capacity to lead them. On February 24, in Charleston, South Carolina, Hillary Clinton held a private fundraiser at a posh private home before a predominantly white crowd of about 100 who paid $500 each to attend. Clinton had just started to speak when a young black woman (who also paid $500 to get it) quietly held up a pillow case with a handwritten message in capital letters – “WE HAVE TO BRING THEM TO HEEL” – followed by #WhichHillary. Making nice at first, Clinton started reading the message aloud and the following exchange took place. HILLARY CLINTON: Well, I’ll tell you what, if you will give me a chance to talk, I’ll—I’ll tell you something. You know what? Nobody’s ever asked me before. You’re the first person to ask me, and I’m happy to address it, but you are the first person to ask me, dear. By this time the audience has become hostile, and security is leading Ashley Williams away (filmed by her confederate who appears to be ignored). HILLARY CLINTON: Um, OK, back to the issues. What have the Clintons done to earn such devotion? Did they take extreme political risks to defend the rights of African Americans? Did they courageously stand up to right-wing demagoguery about black communities? Did they help usher in a new era of hope and prosperity for neighborhoods devastated by deindustrialization, globalization, and the disappearance of work? No. Quite the opposite. To date, Clinton has not addressed the substantive issue of mass incarceration, which seems a pretty clear systemic injustice of long standing. Clinton has taken contributions from the private prison industry, and has given a small proportion of the money to a charity that helps women prisoners adjust to society on release. In October 2015, after months of pressure from civil rights and immigrant justice groups, the Clinton campaign had promised not to accept clearly labeled prison industry contributions. By July 2015, the injustice of the American justice system was plain enough that even Bill Clinton sort of apologized for the 1994 Violent Crime Act. Speaking before the annual meeting of the National Association for the Advancement of Colored People (NAACP) on July 15, Clinton said: “I signed a bill that made the problem worse…. And I want to admit it.” He did not propose to do anything about it. Nor has Hillary Clinton proposed to do anything about the mass incarceration of black Americans or other minorities. She has offered at best kinder, gentler rhetoric. Clinton lies – what else is it? – and the media can’t tell it’s a lie? … you and your family have been personally and politically responsible for policies that have caused health and human services disasters in impoverished communities of color through the domestic and international war on drugs that you championed as First Lady, Senator and Secretary of State. And so I just want to know how you feel about your role in that violence and how you plan to reverse it?… those policies were actually extensions of white supremacist violence against communities of color. And so, I just think I want to hear a little bit about that, about the fact that actually while … those policies were being enacted, they were ripping apart families … and actually causing death. In response, Clinton tried to change the subject. (On August 25, 2015, Reader Supported News published my long report on Clinton’s dismal and unresponsive meeting with Black Lives Matter people in Keene, New Hampshire. The event was reported by others as well, but not widely.) Perhaps that limited coverage contributed to Clinton’s willingness to claim, absolutely falsely, that nobody had ever asked her before. Perhaps she gambled that no one would remember, or even google, the truth. And she would have won that bet with one of the best columnists at The New York Times, Charles M. Blow, whose work is consistently probing and thoughtful. Just not this time – in his February 29 piece, “I’m Not A Super Predator,” about Ashley Williams, he quotes Hillary Clinton saying, “You’re the first person to ask me …” about mass incarceration of minorities. In that moment, I knew that the people of my generation had failed the people of Williams’s. Her whole life has borne the bruises of what was done, largely by Democrats, when I was the age she is now. She said she has grown up knowing families and whole communities devastated by vanishing black people, swept away into a criminal justice system that pathologized their very personage. That night, Williams forced a reckoning. But that’s not true. There has been no reckoning, not so far as Clinton is concerned. There is no Clinton acceptance of responsibility or accountability for inhumane policies, the Democratic Party is still in bed with those who want to privatize government, and the establishment candidate and her party have yet to promise any serious change, much less any real improvement. The private prison scam will continue to be just one more way to loot the public treasury, while having the perverse effect of pressuring governments from local to federal to keep arresting people fast enough and jailing them long enough to keep the profits flowing to people who have no vested interest in justice, rehabilitation, or freedom. Black lives don’t matter to the bottom line of the prison-industrial complex any more than they matter to Hillary Clinton. What does matter to Hillary Clinton? Or Bernie Sanders? In other words, more than two decades of life-destroying criminal policy that she helped implement and support is not an issue for her. She might just as well have said, “I will talk only to white people,” which is pretty much what she did for the rest of the evening. Mr. Speaker, it is my firm belief that clearly, there are some people in our society who are horribly violent, who are deeply sick and sociopathic, and clearly these people must be put behind bars in order to protect society from them. But it is also my view that through the neglect of our Government and through a grossly irrational set of priorities, we are dooming tens of millions of young people to a future of bitterness, misery, hopelessness, drugs, crime, and violence. And Mr. Speaker, all the jails in the world, and we already imprison more people per capita than any other country, and all of the executions in the world, will not make that situation right. We can either educate or electrocute. We can create meaningful jobs, rebuilding our society, or we can build more jails. Mr. Speaker, let us create a society of hope and compassion, not one of hate and vengeance. This demonstrates that the consequences of the crime bill were knowable in 1994, and that some people knew them. This also illustrates the political pressure politicians were feeling about “crime” issues, leading some like Bernie Sanders to vote for a “solution” that he did not believe to be any solution at all. There is no such contemporary prescience expressed by either of the Clintons, leaving their supporters to defend horrible policies with weak excuses like, well, lots of people supported it. One of them in 1994 was Hillary Clinton, whose hardline defense of more cops and more prisons contains no compensating humane concern even close to what Sanders expressed. There is no rational reason why a black male baby born today has a one-in-four chance of ending up in jail. That’s a disgrace. And together, we are going to bring justice to a broken criminal justice system. Hillary Clinton could have said something like that to Ashley Williams at that mostly-white fundraiser in Charleston. She didn’t say anything like that. She didn’t even make the effort. 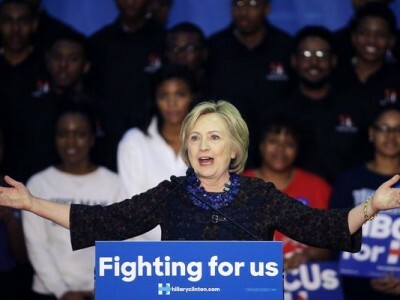 With the removal of the black nuisance, Hillary Clinton said only: “OK, back to the issues.” Three days later, at a Hillary Clinton rally in Atlanta, two Georgia State University students were removed for holding “Black Lives Matter” signs. The Clinton campaign denied any responsibility.